Rockstar Spud and the Monster Among Men. The wedding bells are certainly ringing in the WWE as another Superstar is all set to tie the knot in June. As reported first by WrestlingInc, Drake Maverick will be getting married to former Mae Young Classic competitor Renee Michelle in June. 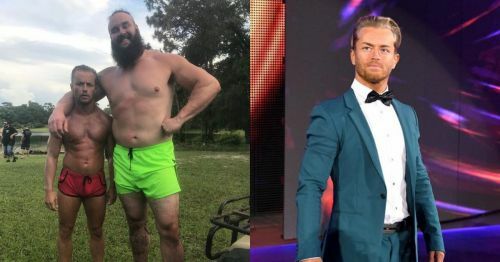 It was also revealed that Braun Strowman will be one of the groomsmen at the wedding alongside two other well-known WWE employees. Maverick is best remembered for his time as Rockstar Spud during his eventful run in TNA from 2012 to 2017. Maverick, who goes by the real name James Michael Curtin, is a pro wrestling veteran who was one of the most active names in the British indie wrestling scene from 2001 until he got picked up by TNA. Along with Dixie Carter and Ethan Carter III, Maverick spent many successful years with WWE's rivals before signing a deal with Vince McMahon's company back in October 2017. He debuted as the General Manager of 205 Live in January 2018 and has continued to portray the babyface role till this very day. A brief managerial stint with the Authors of Pain didn't compel WWE to take him off 205 Live duties. He most recently managed EC3 in a dark segment for SmackDown Live, rekindling their alliance from their Impact Wrestling/TNA days. Michelle took part in the Inaugural Mae Young Classic Tournament in 2017 and lost to Candice Larae in the first round. WretslingInc reports that the wedding will take place in June later this year and Maverick will have Strowman, Jeremy Borash and EC3 as his groomsmen. Mellisa Anderson, also known as Cheerleader MMelissa, will be one of the bridesmaids from Michelle's side. Also, we hope Maverick has an in-ring stint sometime in the near future. A stint as EC3's on-screen manager would be great as well.